We are off to Wichita Fall tomorrow morning after a loss to Ryan Storrie. We’ve had some good practice time here, both drills and competitive play. We will continue that in Wichita Falls since Sasha is not playing doubles there either. We also decided to go to Osaka Japan after Tulsa for the Grade A. We are looking for our first solid performances in 1s and an A. 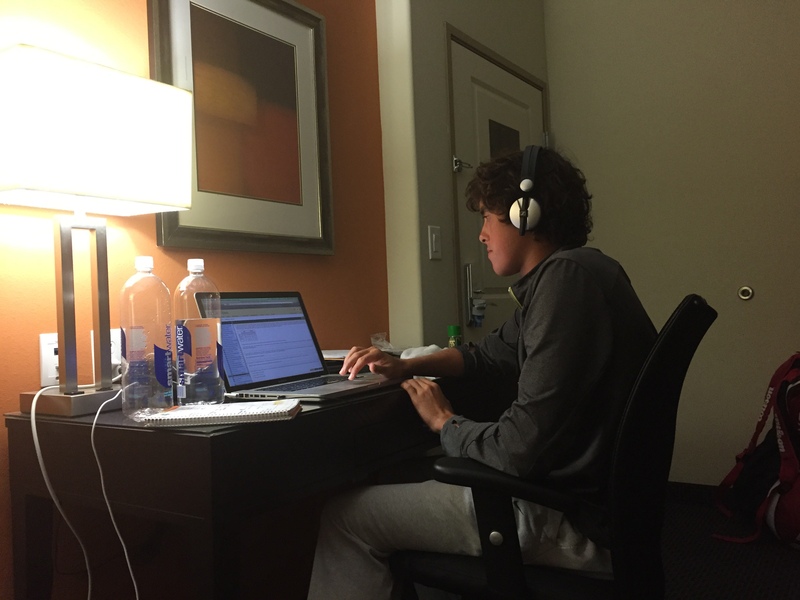 We are in Waco Texas for yet another ITF Junior event. We have a great hotel (Spring Hill Suites)–really good room, actually two, a bedroom and sitting/work area, great breakfast, and a nice gym. Found a good market so we have eaten after a disaster of a meal on the first night. Sasha is the #1 Seed here, so the pressure is on. We’ve been practicing and warming up with Alexandre Rotsaert. Good practice on Sunday after we arrived and good warmups each day. Sasha won his first match yesterday 6-3, 6-3. He played ok–not great, but ok. We have a good schedule here since he isn’t playing doubles. We were back in the hotel yesterday by noon. That was good, we had been up since 5am since he played at 8am. Sasha did a lot of school. He is way ahead in school. So we went to bed quite early to get a good nights sleep for a “not before 10am” start today. Well, he followed a girls match that went 3 long sets so didn’t get on the court until just before noon. Today, Sasha played better. Not as well as he will have to, but much better. Good thing, he needed to. He won 6-3, 6-2. So it was a bit later by the time we got back to the hotel. We had lunch and dinner here–more school and now to bed early again for a 9am match tomorrow. Sasha is in Montreal after a great week of practice at Notre Dame. He is there on his own (with some guidance from my friend Andrea a coach from Toronto). Below is the draw and order of play for the tournament. It’s a little weird for Sasha and I to be talking on the phone about the match instead of getting ready for it together, but, we did talk tonight by phone and will before the match as well. He is playing doubles with Eli Ogilvy. The doubles draw will be out tomorrow around noon and there will be doubles play tomorrow afternoon. This tournament is a 32 draw being played in the 5 day format. Time for a Blog update. After the Canadian Open, Sasha and I headed to our respective homes on opposite coasts for a bit of time off. More time for me than for him though. He is in South Bend at Notre Dame now practicing with his future teammates. His parents are visiting Notre Dame this weekend then he heads off to Montreal again for the Grade 2 ITF World Ranking event. He will be doing that tournament without me. I had a previous engagement that I could not change. Sasha will play doubles with Eli Oglevy from Canada and his coach Andrea will tend to anything Sasha might need. Thanks Andrea!! This week I’ll post an update about the past year and the year to come. You are currently browsing the TennisAdvisor's Blog blog archives for September, 2014.